Virtual CDRom Control Panel enables you to mount ISO disk images as virtual CD-ROM drives. Note: This tool is not supported by Microsoft so you will not be able find it even through a search on Microsoft website. How to extract: Download the self-extracting EXE and extract to a folder of your choice. Launch VCdControlTool.exe. Reverse the steps above to remove the virtual CDROM drive. bitbuerster: Any external file system on Windows must be part of Installable File System chain in order to be visible as a drive, thus by design it must be installed -> cannot be portable. Even this method here "installs", but uses a pre-loaded driver to fool the system. Functionality of any alternative program would be the same, as it would have to access the same driver in the same fashion. Two caveats: The directory path where the tool is installed to may not contain spaces (or you'll end up with a "mount failed" when VCDControlTool tries to actually mount an ISO). And 2nd, using the tool with Vista will work as admin only and you'll see the freshly mounted drive only from within an admin CMD.EXE command line (or from within VCDControlTool.exe's built-in file browser), but not from Vista's Windows Explorer. -Anyone else with a 1) portable, 2) free and 3) Vista/Win7 compatible ISO-mounting utility? if you use the program to run a dvd iso then use MediaPlayerClassic (freeware program) and go to File\Play DVD, it will play the DVD iso without any problems. Although it says it is compatible with Vista, I believe the driver will not load correctly in Vista. 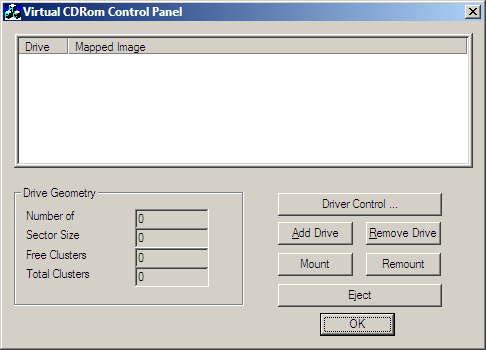 I revisited Virtual CdRom Control Panel today by mounting a DVD ISO image. Running Intervide WinDVD and attempting to play that image crashed Windows XP SP2 with a blue screen instantly. Is it supported by anyone? Works fine on Windows XP SP2, and you don't have to reboot. Intervideo WinDVD crashes if launched when an ISO is mounted and a real DVD is in the drive (the ISO was a reauthored image of the DVD). Though mentioned as compatible with Vista, it doesn't. Can't load the driver. Does anyone have a fix for this? I can add a drive easily enough, but every time I try to mount an iso to the drive the program stops responding. Has anyone else had this problem? Does anyone know how to fix it?